There’s something euphoric in that jangly D chord that opens up the first 18 bars of “American Girl,” and something liberating about the moments that follow. It calls to mind my ever-evolving concept of what it means to be an American, of what it actually means to achieve the American Dream — something “so close, and still so far out of reach.” It is a song that brought me comfort as a lonesome, out-of-place teenager, who had a yearning desire to belong somewhere. I like to think that all of us have had moments like this — where we ache for comfort and validation, only to find that refuge in a song. And for many of us over the past four decades, Tom Petty’s music provided that sort of sanctuary. Read below a few responses we compiled from Kansas City-based musicians and music lovers about his deep influence. 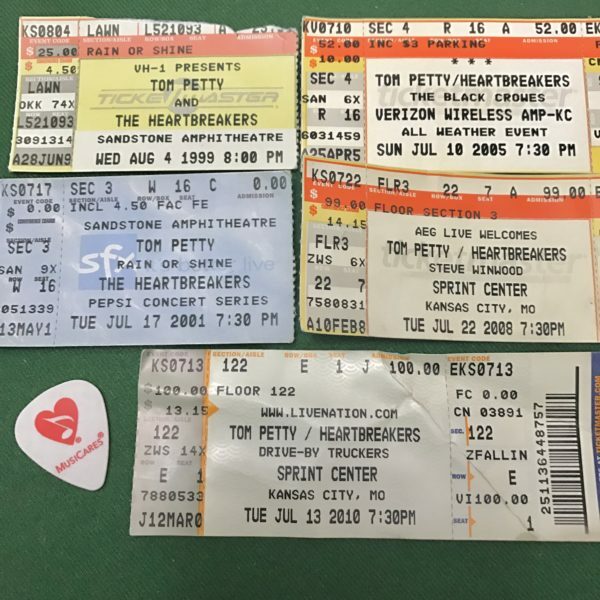 Chris Haghirian's ticket stubs from five of Tom Petty's appearances in Kansas City. He notes that Musicares named Petty the 2017 Person of the Year based on his significant creative accomplishments, his career-long interest in defending artists' rights, and the charitable work he undertook throughout his career, which notably focused on the homeless population in Los Angeles. “I am sure I started with Tom Petty, like most people my age, on MTV. I fell in love with his American rock ’n’ roll. His songwriting resonated with my life and drove me to look deeper into his music. I’ve always wanted to play the bass line to ‘Honeybee,’ and got my wish when the Guilty Birds added it to our set. Two winters ago, I was reconnecting to the guitar and ‘All Right Baby’ was the first song I learned. I purchased the songbook and would relax on the porch with my friends singing along to all his songs. Tom Petty is sunshine, fresh air, cold beer — rock ’n’ roll.” —Michelle Bacon writes for The Bridge and plays drums with Chris Meck and the Guilty Birds. Find her on Twitter or Instagram at @michelleobacon. Share your favorite Tom Petty stories and remembrances with us at @909thebridge.